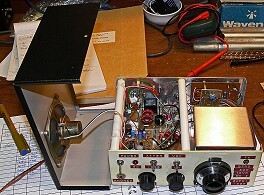 Shown is an external view of my 80m home built QRP transceiver, which is basically a modified Lake DTR-3 built from a kit. 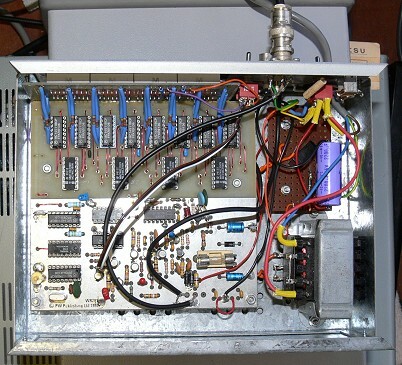 The kit was bought from the now defunct Lake Electronics the proprietor of which was Alan Lake G4DVW who, if my memory serves me developed the transceiver originally as a construction project for his local Radio Club. My version of the original performed well enough, but it had two basic minor flaws from my own point of view, namely excessive VFO drift, and only manual T/R switching. The modular design of the original kit lends itself to experimentation and improvement. Often "improvements" prove to be the opposite, but hey, that's experimentation! 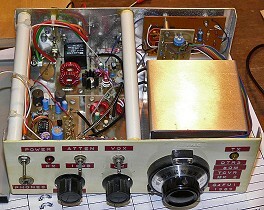 I made several attempts at taming the VFO by varying the VFO coil construction, and the combination of temperature compensation capacitors in the feedback circuit until eventually I was satisfied with the result, plus I added a semi break-in switching board (note the "VOX" switch) to give me that facility. 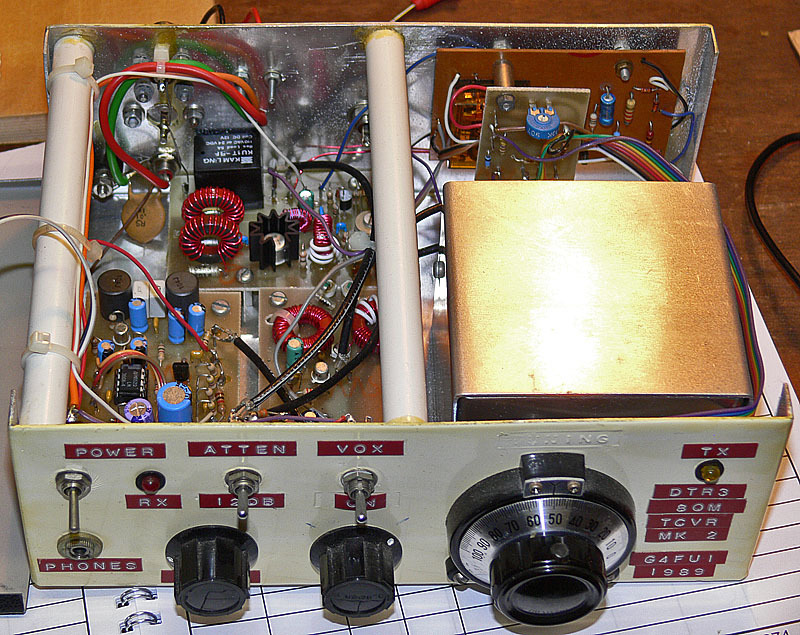 The end result was very pleasing, and I have made many QSOs on 80m with this radio. Output power is between 1 and 2W depending on the supply voltage. The receiver is direct conversion, but incorporates an audio peaking filter which enhances the operating experience significantly. 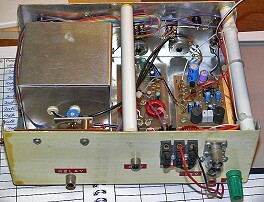 If you look very carefully at the photo, around the "RIT" knob are two pen marks which correspond to the correct netting frequency (station zero-beated with the sidetone which is also centred at the peak of the peaking filter) on either the upper or lower side of the other station when they are zero-beated at the "top dead centre" position. 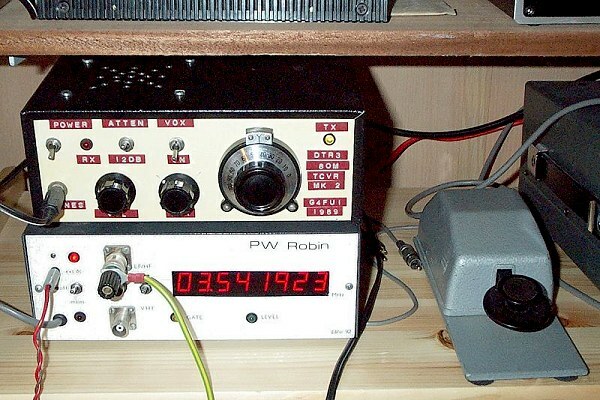 The photo above shows that my "PW Robin" frequency counter is once again proving itself to be a very useful piece of test equipment! The added semi break-in board can be seen at the rear right. 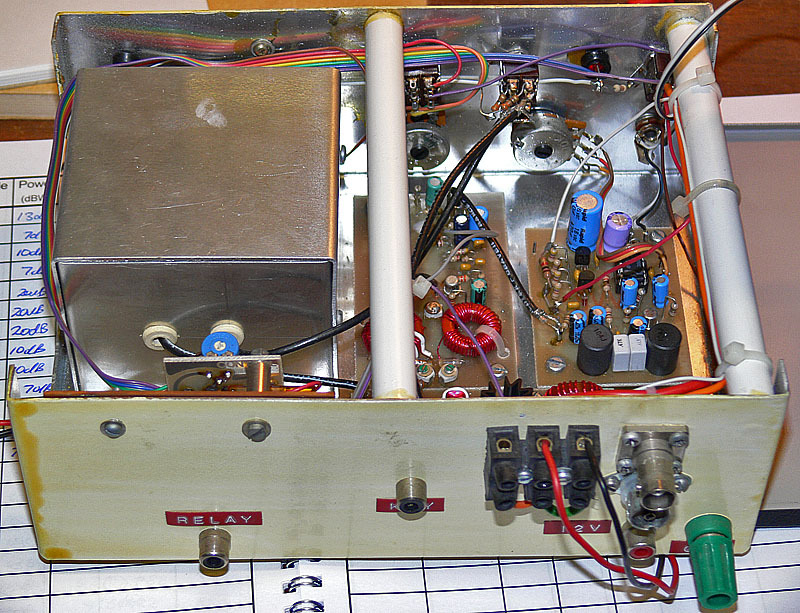 From the rear showing the modified wiring for the break-in board behind the front panel. Schematic of the added semi break-in board and wiring info. Click on the thumbnail to open full schematic in a new window.